Jimmy Christo music video, and major festivals and events including the Melbourne Food and Wine Festival, Moomba, Melbourne Fringe and Melbourne Arts Festival and the Lebanese Festival. Josie is a very busy and popular performer, performing regularly in Melbournes finest restaurants, hotels and reception centres. Josie has conducted courses for people at all levels of Middle Eastern Dance, Seventh Veil, Hawthorn and Hip to Hip Dance Studio, Richmond. Josie also conducts speciality workshops for advanced students featuring sword and veil work, as well as holding courses and workshops for intellectually disabled clients, Helping Hand Association, Coburg. All our dancers are internationally trained and have worked in 100s of shows wowing audiences and providing the ultimate in family entertainment. We also collaborate with talented world music band Jadida and the best drummers and only dabke group in Melbourne, The Lebanese Dancers for Peace with Audi Younes Platinum events and Productions. As part of its mission to create high quality and culturally authentic middle eastern performance experiences for a range of audiences and clients, Melbourne Bellydance is also proud to offer classes and workshops through our school, Hip to Hip. You can also follow Hip to Hip on Facebook. to learn the culture, and to interpret that through my own ethnicity as best as I can. What emerges is a style that I am still developing that brings what I know to what I know about Middle Eastern dance. I embellish the movements to embrace a western theatrical style, which leans towards Danse Orientale. The music I use ranges from traditional Arabic songs to the new pop fads sweeping Lebanon today. My movements range from traditional taqsuim to the painful straining of a beautiful nay to aggressive African pelvic movements to the beat of a darbuka. ​We have hand picked the best Belly dancers in Melbourne. Our dancers are culturally authentic, with many years of training in Egypt, Lebanon and Turkey behind them. We are able to perform culturally specific dance styles with the appropriate types of costuming for community events. Our dancers have been featured on Australian TV, British TV, they have competed in international Belly dance titles and know how to wow your audience. We work with the best drummers and dancers in Melbourne. 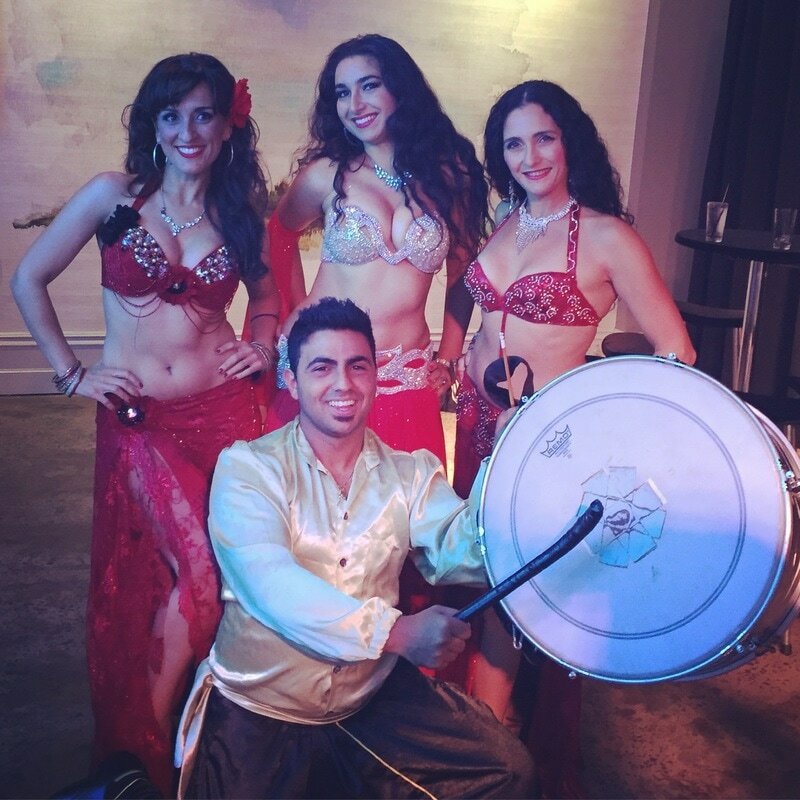 If you are looking to hire belly dancers and drummers for your event, then we can create the perfect package for you. Hire a professional Belly dancer for your party today! BOOK A BELLY DANCER IN MELBOURNE NOW!